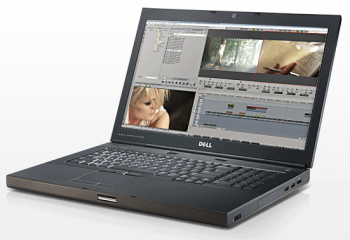 Solid State Drives, or SSDs for short, are taking the laptop world by storm. They’ve been most widely used in Apple’s latest Macbook Airs, giving a solid performance boost to even the most basic configurations. First, an SSD has no moving parts, so it doesn’t have to "spin up" like a hard drive does before it can access data. Spinning up can add 2 seconds or more to the time required to begin reading the drive. This makes the most difference in laptops where it's advantageous to spin down the hard drive to save battery life. To boost the capability even further, Dell also announced the M6600 will have as an option NVIDIA’s latest professional mobile GPU, the Quadro 5010M, which contains 4GB of dedicated GDDR5 memory. As 64-bit hardware with Error Correction Code (ECC) Memory, the card should provide improved reliability and accuracy to professionals working with anything from high definition video editing to mission critical applications like computer-aided-design, finite element analysis and computational fluid dynamics.